Jake and Hope wait at the front door to go in. Note the schnauzer statue in the foreground. 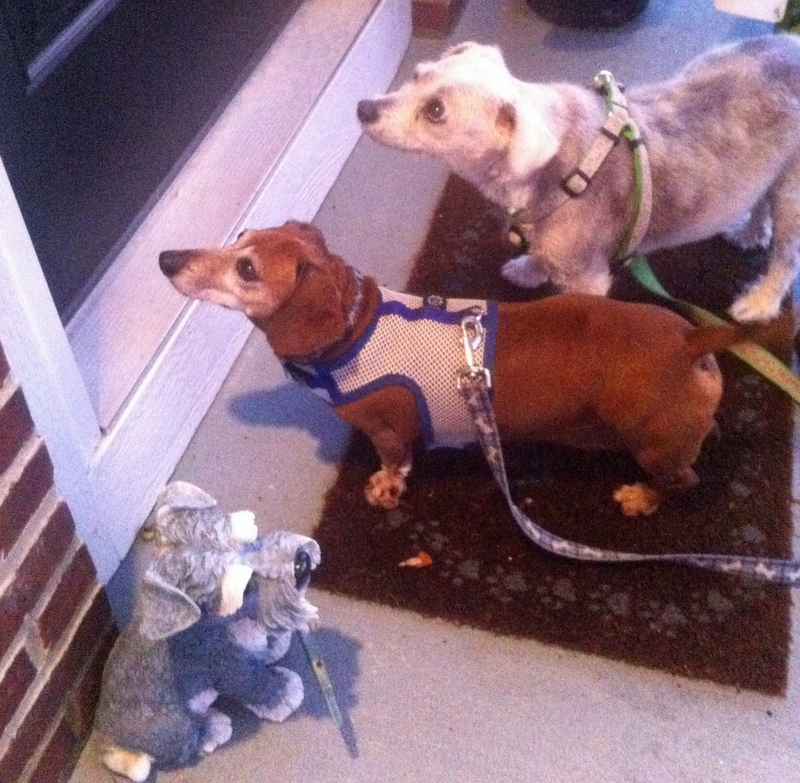 Walking the furkids is a relaxing activity for fall. Jake and Windy do not tire as easily as in summer but are not enamored to walk in twilight or dark. As Hope grew to love her walks, my husband and I joked she could walk herself. On the last half of a block home we liked to let her lead us. 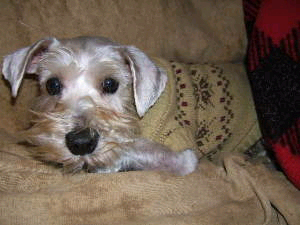 Someone with Schnauzer Rescue Cincinnati sent me the picture that made me fall in love with Hope. I am so grateful. When I saw Hope’s face in this photo I had to meet her. Hope, not long from the Amish puppy mill, in her foster home. We do not regret what we went through with Hope. If we knew what was to come when we met her, we would do it all over again. So, as we walk Jake and Windy each day I always think of how happy our little white schnauzer was to get out in the world. She is in her final home, and we will walk again some day. This entry was posted in Dachshunds, Dog Behavior, Puppy Mills, Schnauzers and tagged Amish, Dog Behavior, puppy mills, Schnauzers, Walks. Bookmark the permalink.